Another year, another Hyper Japan, our 5th time at the Japanese festival, which was on this weekend just gone. We went on the Friday, as we always do. 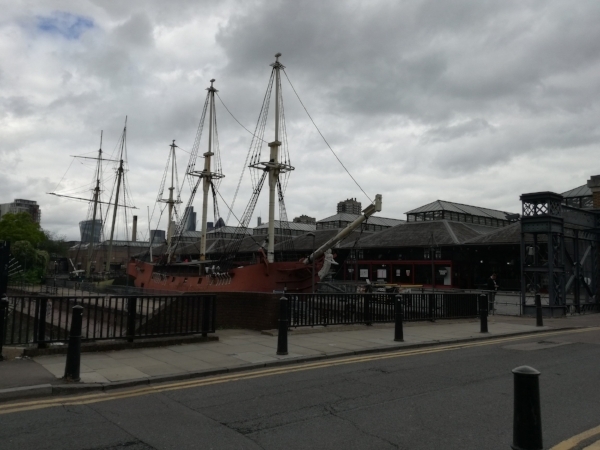 The venue was different, though they have used it for their Christmas Market before, but it was our first time at Tobacco Dock in the Docklands area of London’s East End. It was easy to get to, on the underground from Waterloo station then about a 10minute walk from Wapping Station. I’d never been to this part of London before; it seemed to be a mix of affordable housing alongside obviously expensive buildings. We weren’t that far from Whitechapel; if we’d had the time, I wouldn’t have minded having a bit of a nosy there. I have to admit, I enjoyed the building more than the festival itself. Tobacco Dock was built around about 1811 as a store for, you guessed it, imported tobacco. The original complex was huge; it’s walls surrounded 70 acres of buildings, quays and jetties! What remains is less than half the original. In the 1980s, it was modernised with the aim to turn it into a shopping arcade. The brick building’s original Victorian shell was retained with its brick vaults and ironwork, while shops were built over two floors. Two ships were built specially as children’s play areas and to teach them about piracy. Interestingly, the ships were designed and named after real ships. Unfortunately, after about six years later, the shopping arcade and surrounding area had turned into a ghost town. Didn't get a good view of the other ship, but I think this one was based on ‘The Three Sisters’, which was a trade ship built in 1788 at the nearby Blackwall Yard. It imported spices and tobacco from the East and West Indies. For me, the layout of the place didn’t serve the festival well. What I’ve always enjoyed about Hyper Japan was the openness. Apart from feeling inclusive and welcoming, it was easy to see where things were, making your shopping/browsing experience straightforward and easy. The layout at Tobacco Dock was a little confusing, and I spent a lot of time walking back and forth, trying to remember where certain shops were. Most of them were tucked away in what would have been the different shops when the place was a shopping arcade. To add to the confusion, each ‘shop’ had numerous stalls in them, which you could only see when you entered the shop. Also, the entertainment acts were tucked away, some in a room on the ground floor and most of the live acts in a room on the second floor. Unless you actually went in, you couldn’t see or hear them. Some acts were out amongst the people, but the small stages and poor acoustics didn’t help. At other venues, the acts were part of the whole experience because they weren’t tucked away; the stages were out in the open amongst the other stalls, and you could hear/see them whether you were interested or not. At the end of the day, I was left feeling like I’d visited a shopping mall, and I’m not a big fan of shopping malls. I didn’t take that many pictures, even though there were some fantastic cosplayers. The boys had a good time, although they weren’t too keen on the venue either. But they were pleasantly surprised with what they bought, none of which had even featured on their to-buy list. For all that whinging, I’m glad we went. We got to see, albeit briefly, a part of London we’ve never been to, and we got to spend the day together. We’re still planning on going next year… finger’s crossed, they decide to change the venue. Again. These statues are by the north entrance. The world’s largest exotic pet store in the late 1800s, Jamrach’s Animal Emporium, was located nearby. It’s owner, Charles Jamrach, was born in Germany. He moved to London and became a leading importer, exporter and breeder of animals. I spent a long time wondering why the name, Jamrach, seemed familiar. I had to look it up; it was he who provided the London Zoological Gardens with the grey wolf that subsequently escaped in Bram Stoker’s ‘Dracula’. Apparently the boy sued Mr Jamrach and was awarded £300 in damages. The colourful box in the middle is to do with something they’ve recently discovered, and which Gordon is really into. It’s a very popular programme in Japan called Kamen Rider; it’s been going on for years and has so many different forms. The toys are made for children but are so detailed with so much electronics packed in, I’m not surprised that adults collect them. Gordon was not expecting to find any Kamen Rider stuff at all. When he saw this, I thought he was about to pass out! Gordon's very first anime, Sailor Moon; he still enjoys it. Liam’s loot; not as much, but he was being sensible with his money and he really wanted the Saber statue from his favourite anime, ‘Fate’. This figure, Scáthach, features in another part of the ‘Fate’ universe. Like most of the characters, she’s based on a real person, a legendary Scottish warrior and martial arts teacher who trained Cú Chulainn, the hero of Ulster. I find the attention to detail on these statues stunning. I confess to going a teeny bit overboard taking pictures of his Saber statue - the way the movement has been captured is just stunning. The sword on the ground is Excalibur, and she’s holding the form of Excalibur known in the ‘Fate’ story as Invisible Air - it hides Excalibur's form and conceals her true identity, Arthur. Yes, a female Arthur. And it works! So cleverly done, I think, and she’s my favourite character.